The U.S. higher education system has come under a lot of backlash lately, particularly for the continually climbing price of tuition at colleges across the nation. And yet, many people are still paying for the education because they believe that the return on a college degree is worth it. At NerdWallet, we understand these concerns and want to bring as much transparency to pricing to our readers as possible. To help, we’ve launched this series, Biggest Bang for Your Buck, to identify the colleges in a particular state that offer the best return on your dollar. These schools top the list not only for their academics, but also for their financial assistance and commitment to helping students reach graduation with the lowest amount of debt possible. In February, we presented California’s Biggest Bang for Your Buck Colleges, and this month we crunched the numbers for Pennsylvania. The Keystone State is known for being home to the Liberty Bell, the Pittsburgh Steelers, oil and gas reserves, and a wealth of colleges — approximately 260 total, according to the National Center for Education Statistics. 1. Is the college generally affordable, and does it offer aid? We included the average net price, which is the price after grants and scholarships, and this constituted 50% of the overall score. 2. How does the college appear to the public eye? We measured the prestige and quality of the school through Forbes’ rankings and weighted this as 30% of the overall score. 3. Do students graduate within six years? We included graduation rate within six years, which is the average number of years it takes students to graduate, and weighted it as 10% of the overall score. 4. Do students pay back their loans on time? Loan default rates accounted for 10% of the overall score. While private colleges are often stigmatized for their high price tags, Pennsylvania schools prove that private colleges sometimes offer the best value education. All but two colleges in the top 15 are private schools. Pennsylvania colleges appear to be successfully addressing how to repay student loans on time. All schools in the top 15 had loan default rates below 5%. Leading colleges and universities in Pennsylvania are expensive compared to the national net-price average for private colleges ($12,460). To help ease the financial burden, in-state students can consider attending two-year colleges before transferring to a four-year school. This college, with its high graduation rate and low student loan default rate, topped our list of Biggest Bang for Your Buck colleges. Located about 25 minutes by car from Philadelphia, Swarthmore is a small, private liberal arts college with an impressive reputation. Not only does the college provide students with a top education, it also publishes transparent financial aid and cost information clearly on its website. The site states that during the 2013-14 academic year, the college provided 52% of students with scholarship assistance based on financial need. The one Ivy League college on the list, UPenn is known for its prestigious academic reputation and, since 2008, for its no-loan policy for students who qualify for financial aid. While 30% of students do still take out loans, any student who qualifies for aid is offered additional grants — or money that doesn’t have to be paid back — in place of loans. At Penn, 63% of students receive financial aid and 48% receive grant awards. A need-blind school — meaning that the college admits students without regard to their financial need — Haverford has also recently moved to a no-loan policy for eligible students. Starting with the class of 2012, the college began replacing loans with additional grant money for students who qualified for financial aid. In the past, a standard aid package consisted of $14,250 in loans over the course of four years, which is now replaced with grant aid. All financial aid dispensed by the college is based on need and not merit. Home to the Nittany Lions, Penn State is one of only two public universities to make it onto our top 15 Biggest Bang for Your Buck colleges. Many students benefit from the university’s extensive network of commonwealth campuses, which help to keep costs low by allowing students to attend college close to home for two years and then transfer to the flagship campus for their remaining years of study. At University Park, 69% of students receive financial aid and 37% receive grants. A small women’s college located about 25 minutes northwest of Philadelphia, Bryn Mawr offers its students intimate class settings along with substantial financial assistance. To expand its offerings, the college provides transportation to nearby Swarthmore and Haverford colleges where students can take courses, attend social events, join organizations and sometimes even live in residence halls. Students can also take classes at University of Pennsylvania — a half-hour drive away — if they provide their own mode of transit. At Bryn Mawr, 71% of students receive institutional grants, averaging $26,349. Situated on the east edge of the state between Philadelphia and New York City, this small college keeps both class sizes and loan default rates low. The college specializes in hands-on learning, offering research experiences in the field, community-based learning projects and global studies to its students. According to the school, more than $41 million in scholarships and grants were dispersed among half of the student body, and 95% of graduates in recent years are employed, in graduate school, completing service work or hold an internship within six months of graduation. Named for Benjamin Franklin and John Marshall, this school is located in Lancaster, home to one of the largest Amish populations in the U.S. But this school is far from staid: At F&M, freshmen live in one of five Harry Potter-style houses where they dine and attend events together. Many students are also involved early on in their academic career with research, which is amply funded by the school. Students also benefit from aid that goes toward tuition and housing: 49% of students received institutional grants, averaging $27,979. The other public school on our list, Pittsburgh has a student body of more than 28,000, in addition to the students who comprise its four regional campuses. Well-known for its schools of medicine, education and engineering, the college also offers a vibrant social setting, as it’s situated just a few miles from the city center. To help finance both tuition and living expenses, the university offers grants to 32% of students, and 49% of all students receive grants from either the school or elsewhere. The average grant award of any type is $10,833. During the 2011-12 school year, 100% of full-time students received some form of financial aid. Additionally, all students received a grant award, averaging $19,488. On top of generous financial aid, the school also promotes several unique academic initiatives, says Director of Media Relations John Wall. These include the school’s flexible curriculum based on tailored areas of study rather than rigid majors; assigning two faculty advisers to each student to increase communication and accountability; and innovative retention programs designed to keep students in college at an affordable price. Gettysburg stands out on our list for having the lowest student loan default rate, at 0.4%. This can be attributed, in part, to the fact that the school awarded $47 million in financial aid over the past year, helping students finance their education with fewer or no loans. Jamie Yates, director of communications and media relations, says the school also excels in helping students find work: 94% of the class of 2012 was employed or in graduate school within a year of graduating. Villanova is a mid-sized private school affiliated with the Roman Catholic Church. Popular majors at the school include business, marketing, health and journalism. At Villanova, 60% of students receive financial aid, and 50% receive grants, with the average award being $23,910. “The actual out-of-pocket cost to attend Villanova is often the same as that of less-costly institutions, because grants, loans, and other forms of aid can fill the financial gap between the total cost of attendance and what your family can afford,” the school’s financial aid website states. Dickinson is another college that is well-known for its commitment to sustainability. Situated on the outskirts of Harrisburg, Dickinson is popular for its international studies major and boasts an impressive number of Fulbright Scholars. To assist students in meeting academic goals, Dickinson offers generous aid packages. According to the school, every student who demonstrated need and meet financial aid deadlines from the most recent freshmen class received aid. The average need-based package for grant students was $35,056. A highly selective university located in Pittsburgh, Carnegie Mellon is well-known for its environmental leadership and cutting-edge research initiatives, such as a self-driving vehicle. To help foster this creative environment, Carnegie Mellon offers 57% of its students a grant from the university, so that those with financial need can focus on class instead of money. Additionally, 44% of students receive a non-university based grant award. The average grant per student, of any type, is $23,232. View the complete listing of Pennsylvania’s Biggest Bang for Your Buck Colleges. 1. Net price as reported on the White House College Scorecard. This is the price a student actually pays after taking into account all financial aid that doesn’t have to be paid back, such as grants and scholarships. 2. The prestige and quality of a school as determined by Forbes rankings of America’s Top Colleges. 3. Graduation rate within six years as reported on the White House College Scorecard. 4. Loan default rate as reported on the White House College Scorecard. Additional notes: We did not include Grove City College in our study, despite it being ranked in the top 400 of Forbes’ America’s Top Colleges, because there was no data available for the school on the White House College Scorecard. Financial aid data, unless otherwise stated within the individual school summary, refers to full-time undergraduate students in the 2011-12 academic year. 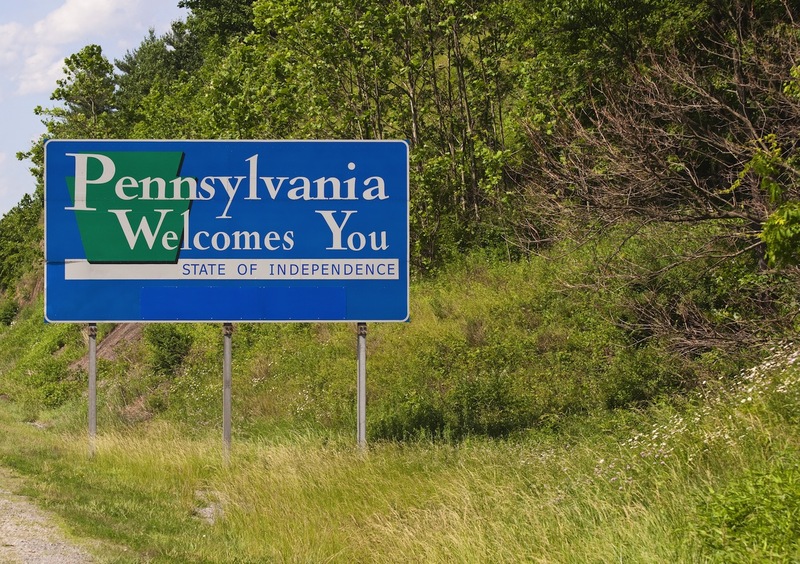 Image of Pennsylvania sign courtesy of Shutterstock.